This is the internal screen mounting frame assembly for the iPhone 3GS. This internal structure is vital to the iPhone's operation as it houses the home button circuit, earpiece, proximity sensor cable and the touchscreen. 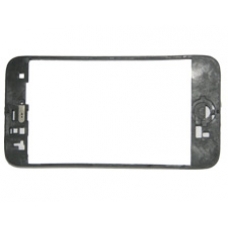 The rubber screen gasket / seal is part of this frame assembly, the rubber gasket or screen seal is easily damaged when removing the screen from the iPhone, if you replace this part you will have a perfect gasket seal on your iPhone that prevents dirt dust and water effecting your iPhone. * Original Apple iPhone Part. * Includes Rubber Gasket / Seal.